After your WordPress site is installed and you've selected a theme, you can use Page Builder (What is Page Builder?) to modify your site pages. You open Page Builder from the specific page you want to edit in your WordPress dashboard. For more information on adding Page Builder when setting up WordPress for the first time, see Set up WordPress for the first time. Note: You'll have the option to install Page Builder when you set up WordPress for the first time in Managed WordPress or cPanel. 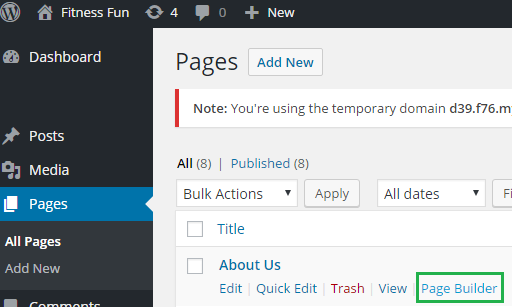 Click the Pages tab from your WordPress Dashboard. Find the page you need to modify. Hover your mouse under that page, you will see the Page Builder. Click Page Builder to start making modifications to your page.